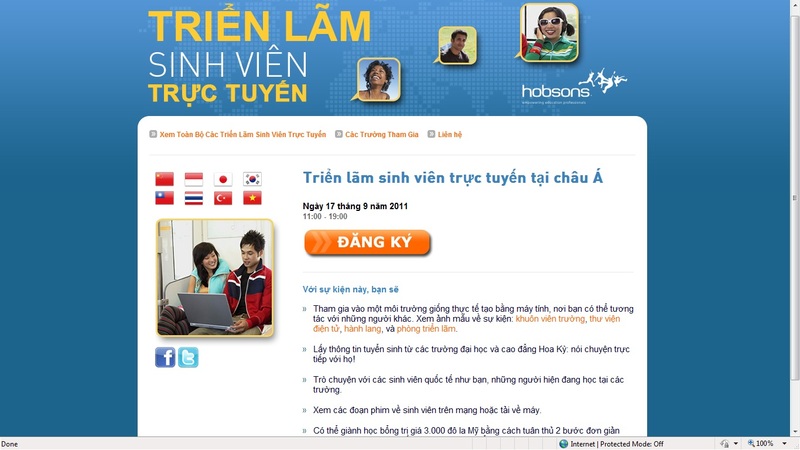 Vietnamese young people who are thinking about studying in the US will have yet another useful source of information at their disposal: the Hobsons Virtual Student Fairs (VSF) on 17 September. The VSF is free and open to students from across Vietnam who are interested in pursuing a bachelor’s or a graduate degree at a U.S. university. Much like a traditional student fair, the VSF features booths staffed by university representatives. But because the fair takes place online, it is much more accessible and convenient for students to attend; all they need is an Internet connection. In the virtual fair environment, Vietnamese students will be able to view photos and videos of the U.S. universities, download materials, and chat live with admissions officers, professors, and current students. The booths at the fair are segmented by level—undergraduate and graduate—so students can easily find the schools that offer the degrees they’re looking for. Parents and counselors are also encouraged to attend the free event to learn about the U.S. colleges and universities. The VSF will be “open” from 11:00hs–19:00hs on 17 September. Visitors should expect to spend 1.5­–2.5 hours visiting the virtual booths and chatting with university staff members. As a bonus, the exhibit hall will remain open for repeat visits for 90 days. While university staff will not be available for chat during this time, all of the videos, photos, and text documents will still be there to review and download. This will give students the flexibility to go back for another look at a school they liked, or even to visit for the first time, if they weren’t able to participate in the live event.